Jewish favorite of the sultana Baffa, who was the wife of Murad III. and the mother of Mohammed III. (not, as Graetz designates her, the mother of Mohammed IV. ); died 1600. The widow of one Elias Chandali, Esther gained great influence in the palace as the protégée of Baffa. In a firman of Osman II. issued in 1618 the privileges granted to Esther by his predecessors are confirmed and secured to her grandchildren. From this firman it appears that Esther was first rewarded by Sultan Sulaiman II. in 1548 for services rendered by her to his mother. The extent of Kiera's influence with Baffa may be seen from the following facts, undoubtedly authentic: When Catherine de Medici wrote in 1584 to Baffa asking her support for the promotion of the waywode of Wallachia, Esther was employed by Baffa to see that the Turkish translation accompanying the Italian text of the letter was correct. Again in 1587 Baffa wrote a letter of recommendation and approval in regard to a certain lottery started by Kiera. The favorable attitude of the Venetian republic toward this lottery was the cause of the issuance of seven firmans granting certain privileges to the republic. This shows that the business transactions carried out by Esther were made possible by the cooperation of the harem through the personal influence of Baffa. Many important diplomatic transactions and many appointments to military and administrative offices were made through Kiera; and her long career under three sultans testifies to her ability and ingenuity. The representatives of the European powers often applied to Kiera and secured concessions through her. They variously refer to her in their writings as "Kiera," "Chiera," "Chierara," "Chirazza," or "Chiarazza." 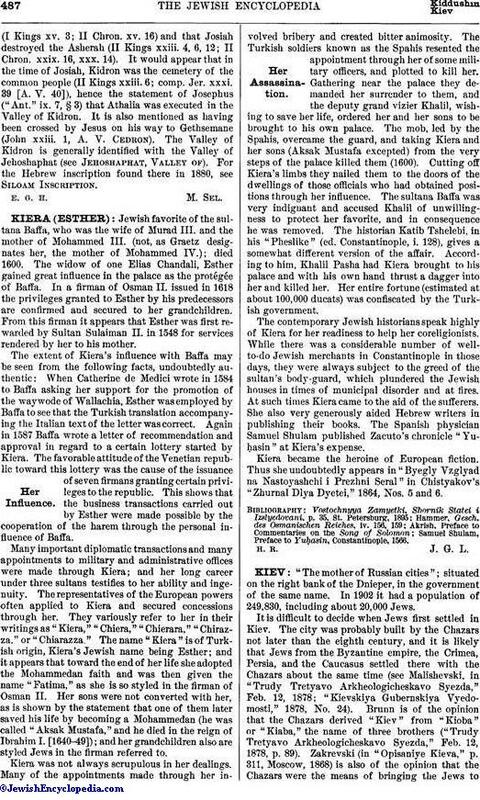 The name "Kiera" is of Turkish origin, Kiera's Jewish name being Esther; and it appears that toward the end of her life she adopted the Mohammedan faith and was then given the name "Fatima," as she is so styled in the firman of Osman II. Her sons were not converted with her, as is shown by the statement that one of them later saved his life by becoming a Mohammedan (he was called "Aksak Mustafa," and he died in the reign of Ibrahim I. [1640-49]); and her grandchildren also are styled Jews in the firman referred to. Kiera was not always scrupulous in her dealings. Many of the appointments made through her involved bribery and created bitter animosity. The Turkish soldiers known as the Spahis resented the appointment through her of some military officers, and plotted to kill her. Gathering near the palace they demanded her surrender to them, and the deputy grand vizier Khalil, wishing to save her life, ordered her and her sons to be brought to his own palace. The mob, led by the Spahis, overcame the guard, and taking Kiera and her sons (Aksak Mustafa excepted) from the very steps of the palace killed them (1600). Cutting off Kiera's limbs they nailed them to the doors of the dwellings of those officials who had obtained positions through her influence. The sultana Baffa was very indignant and accused Khalil of unwillingness to protect her favorite, and in consequence he was removed. The historian Katib Tshelebi, in his "Pheslike" (ed. Constantinople, i. 128), gives a somewhat different version of the affair. According to him, Khalil Pasha had Kiera brought to his palace and with his own hand thrust a dagger into her and killed her. Her entire fortune (estimated at about 100,000 ducats) was confiscated by the Turkish government. The contemporary Jewish historians speak highly of Kiera for her readiness to help her coreligionists. While there was a considerable number of well-to-do Jewish merchants in Constantinople in those days, they were always subject to the greed of the sultan's body-guard, which plundered the Jewish houses in times of municipal disorder and at fires. At such times Kiera came to the aid of the sufferers. She also very generously aided Hebrew writers in publishing their books. The Spanish physician Samuel Shulam published Zacuto's chronicle "Yuḥasin" at Kiera's expense. Kiera became the heroine of European fiction. Thus she undoubtedly appears in "Byegly Vzglyad na Nastoyashchi i Prezhni Seral" in Chistyakov's "Zhurnal Dlya Dyetei," 1864, Nos. 5 and 6. Samuel Shulam, Preface to Yuḥasin, Constantinople, 1566.